Crowds waiting for the parade of the famous 369th [African American] Infantry, formerly 15th New York regulars, New York City. From the U.S. National Archives. Freedom Struggles: African-Americans in World War I. Adriane Lentz-Smith, Harvard, 2009, 318 pages, illustrations, index, notes, ISBN978 0 647 03592 8, $35 cloth. The author is a Professor of History at Duke University. This is an elegant yet powerful social history of a crucial point in America’s history. The author identifies the decade of World War I as a watershed in black America’s fight for political equality and social justice. Heeding the call of leaders such as W.E.B. DuBois, African Americans volunteered in large numbers for military service in hopes of validating their claims to full citizenship. 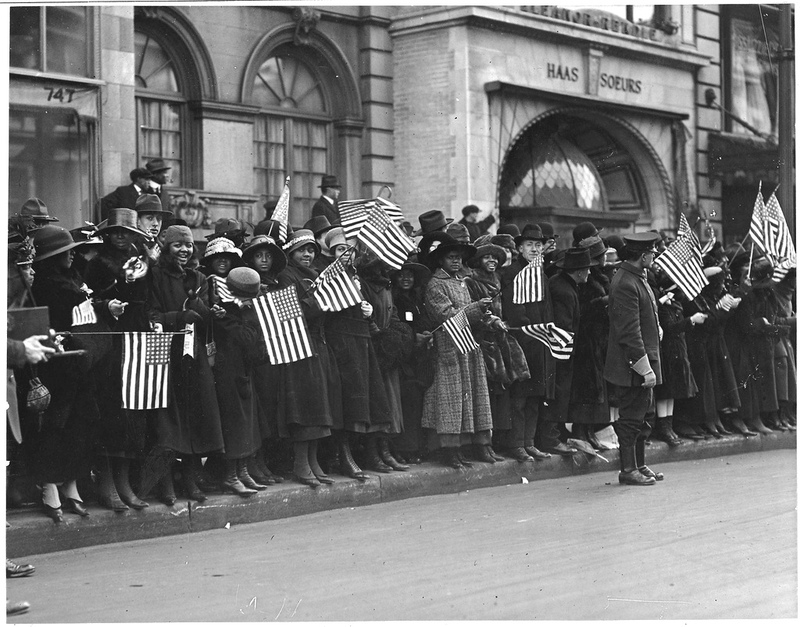 As many as 200,000 served overseas in WWI mainly as laborers, construction workers and stevedores. Unfortunately, the Army enforced the segregated Jim Crow social norms of the Southern and border states, both at domestic training camps and overseas in France. Many thousands more black people moved north to escape segregation, work in war industries and seek new educational opportunities, sparking racial tensions there as well. The Wilson administration was not sympathetic to the calls of the newly founded (1909) NAACP for full citizenship for black people and, indeed, proceeded after 1913 to segregate the federal government, which had previously largely integrated its work force and opened post office and other patronage jobs to black people in the South. Though France had its own peculiar racial mores and barriers,white Army officers and politicians feared that French men (and particularly women) would undermine their efforts to keep black Americans under Jim Crow regimens. Service overseas brought young African Americans in contact with many other men of color from Asia, the Middle East, Africa and the Caribbean, widening their horizons and opening their minds to the concept of a vibrant African diaspora. Returning home in the “Red Summer” of 1919, black veterans found little had changed in American society. The Red scare, which came in the wake of the November 1917 Bolshevik Revolution, was accompanied by widespread racial violence. Some 38 violent riots rocked American cities from Detroit to Omaha. Black soldiers were lynched in the South. The Ku Klux Klan rode again in the North and Midwest. Expectations of birth of a new freedom for African Americans were crushed. On the positive side, it was also a period during which African Americans developed the sophistication they would need to expand the fight for equal rights. What was hoped for after 1919 was demanded and won after 1945 by determined and patriotic African Americans who had learned from the Great War. This entry was posted in Books, Doughboys, Post-war and tagged African Americans, Black History Month by World War One Historical Assn. Bookmark the permalink.